Tyrone GAA Star Sean Cavanagh has been announced as supporter of the Basketball Hall of Fame Belfast Classic. The sporting event runs from November 29 to December 1 and Sean has come forward to give it his support as well as the tournament organisers Sport Changes Life in flying the flag for the impact basketball can have on a young person’s life, both on and off the pitch. Sean – a five-time All Star winning Tyrone Gaelic footballer – has won all-reland championships for Tyrone at Minor level and three times at Senior level. More recently, Sean has become an advocate for basketball being the perfect supplementary sport for young Gaelic players to develop their ball skills. When his GAA schedule allows, Sean is currently playing basketball with Tyrone Towers basketball team in Dungannon. Commenting on his support of the upcoming Basketball Hall of Fame Belfast Classic, Sean said: “Basketball is a much more physically demanding game than GAA and we would have played it in the off season for training with Tyrone at county level. The skill levels and thinking required to play basketball are much higher than most people perceive who haven’t played it. Therefore, I am extremely proud to announce my support of this year’s Basketball Hall of Fame Belfast Classic and am very excited to help welcome big basketball to Belfast once again. Marc Mulholland, Executive Director of the Belfast Classic, said: “We are delighted that Sean has announced his support of this year’s Basketball Hall of Fame Belfast Classic. Tournament supporters have come from across the island of Ireland and the United Kingdom, highlighting all ages, genders, backgrounds and abilities within the sport of basketball and underling that – with dedication and commitment to the sport – the sport can take young players anywhere, from local grassroots clubs to national squads, and World championships – or even the Gaelic pitch. Joining Sean in support of the Belfast Classic are tournament ambassadors Kerry GAA and Irish national basketball legend Kieran Donaghy; Irish International ladies captain, Tipperary’s Grainne Dwyer; and, Belfast native, Sheffield Steelers and Team GB Senior Men’s Wheelchair Basketball champion James MacSorley. The second Belfast Classic tournament will kick off at Belfast’s SSE Arena on November 29. Held in partnership with the Sport Changes Life Foundation the tournament will double in size for its second year and will see eight collegiate basketball teams from across the USA battle it out, with just two teams being awarded with Belfast Classic Cups at the tournament’s close. 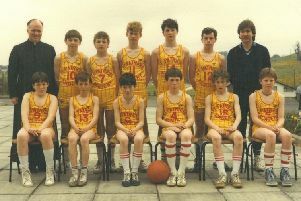 For more information, visit www.belfastbasketballclassic.com.